Photo lifted from the 801/492 BG Website and used here with permission. We don't know if this crew picture was take while with the 492nd or after the McLaughlin Crew was transferred to the 801st/492nd BG, 858th BS in August of 1944. The crewmen in the photo are currently all unidentified. 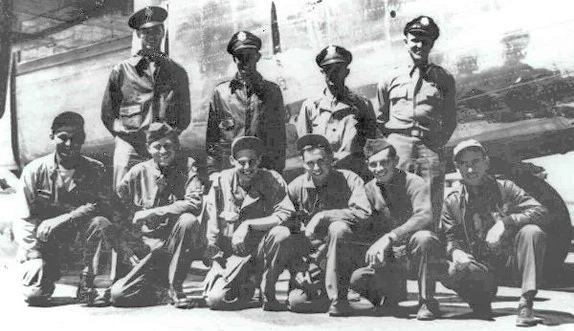 The McLaughlin Crew was one of the original crews for the 492nd BG that trained in Alamogordo, New Mexico. They transferred in as crew 1669 from the CCTS (Combat Crew Training School) in Biggs, Texas, on 3 Mar 44. The Crew had a couple of personnel changes while at Alamogordo. They were assigned to the 858th BS, designated as Crew 811. 2nd Lt James McLaughlin signed out for a B-24J, 44-40086. They gave it the nickname LAURA JO. In April 1944 they flew their assigned aircraft to North Pickenham, England, via the southern route. Their ground Crew Chief, S/Sgt Kubilis, flew with them, bumping Sgt Brewer onto the Queen Elizabeth. By our count, Lt McLaughlin flew as the aircraft commander for Crew 811 for a total of 25 missions, plus two aborted ones. We can't be positive of all of the personnel changes on some of their missions. It's always possible that the bombardier could have missed the pathfinder-led missions. On 19 Jun 44, the 858th was dismantled. Its staff was reassigned to Cheddington as the 8th Composite Command for leaflet dropping. The air crews, ground personnel and planes were reassigned to the other three squadrons. Thus the 492nd became a three squadron group. Each squadron was allowed to have 24 crews instead of the traditional 18 crews. The McLaughlin Crew 811 was reassigned to the 856th BS. We don't know what their new crew designation number was. The mission on 29 Jun 44, was another rough one for this crew. Their plane took a beating by flak while bombing Magdeburg. The hydraulic system was shot up and three of the engines had been hit. They almost bailed out. DeVries and Norgard were able to stop the hydraulic leaks. After checking their gas situation, McLaughlin decide to try for England. A P-38 came by and escorted them back. McLaughin was able to land at North Pickenham without incident. DeVries was awarded the Distinguished Flying Cross for saving the ship and crew. The McLaughlin Crew had a couple of personnel changes by the time they transferred to the 801st/492nd BG, 858th BS in August. With the new group, they were accidently shot down by Allied anti-aircraft guns on the night of 16/17 Sep 44. See "McLaughlin Story" link. Page last modified Friday, January 22, 2010.